Your wedding is one of the biggest days of your life and you don't want to worry about the unexpected. Let SPI Steve Pore Insurance Agency help you find the right wedding insurance coverage to protect your special day. Wedding insurance can help cover those incidents that may occur during your event including accidents, damage or loss. Personal finance experts recommend that when planning a wedding, couples consult with an independent insurance agent first. Travelers has created an insurance policy that offers our customers financial protection if certain unfortunate, unforeseenevents occur. Today's weddings have an average price tag of $28,000. Of course, couples are squarely focused on their special day, not on what could go wrong. Yet it's all to common to lose a high-dollar deposit when a bridal dress or formal wear shop suddenly closes, or a hurricane causes the wedding to be postponed. You wouldn't buy a new car that cost $28,000 without insuring it, so it's important to speak to us about wedding insurance. Protecting your event with our Wedding Protector Plan from Travelers Insurance could save your special day from being a total disaster. Underwritten by Travelers, the Wedding Protector Plan is special event insurance coverage which provides several different types of coverage and coverage enhancements for the wedding day, rehearsal and rehearsal dinner. Events that have any of the following activities are not eligible for our program: rides, mechanical devices, inflatable recreational devices, dunk tanks, bungee operations/equipment, petting zoos, live animals, water sports, fireworks, pyrotechnics, or flammable sky lanterns. Special attire -- You can get repair or replacement cost of the honoree's wedding gown or tuxedo if lost or damaged. Lost rings -- You can receive repair or replacement cost if the wedding bands are lost or damaged. Lost Deposits -- We can reimburse your deposits if a vendor goes out of business, declares bankruptcy before your wedding, or simply fails to show up. Severe weather -- If severe weather (such as a hurricane) forces you to postpone your wedding we can provide reimbursement for non-recoverable expenses. Transportation shutdown -- If you have to postopne the wedding because a commercial transportation shutdown prevents the honorees or their immediate family from getting there, you can receive reimbursement for non-recoverable expenses. Military deployment -- If the honoree is unexpectedly called up to active duty or has her or his military service leave revoked, forcing you to postpone the event, we can provide reimbursement for non-recoverable expenses. Photos and videos -- If your photographer's film or data storage is defective, or negatives are lost or damaged, we can help cover the cost to re-take new photos. Damaged Gifts -- You can get repair or replacement cost if your wedding gifts are damaged. 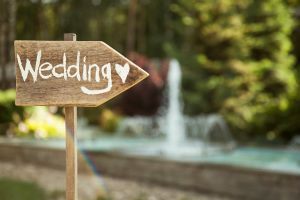 Sudden illness -- If the wedding needs to be postponed because sudden illness prevents the honorees or their immediate family from attending, you can receive reimbursement for non-recoverable expenses. Venue requires insurance -- As an additional option to your policy, you can add liability coverage to protect yourself in case a guest is injured or causes damage to property. Liquor Liability coverage -- As an individual liability option to your policy you can add this coverage when you purchase liability coverage to protect yourself against liability arising from alcohol-related occurrences. Other expenses -- If a vendor becomes unavailable for your event but you can find a last minute replacement, we can reimburse you for the difference in cost.